About your trip at the Trasimeno Lake, enjoy a day to Polvese Island, the biggest one among the three islands of the famous Umbrian lake. We suggest you a day-trip to the Polvese Island also to enjoy its magnificent landscapes and the panorama offered by the area. You will walk with bare feet on the beach, sunbathe along the bank, refresh yourself with something to drink looking the show of the red-orange lights of the sunset, when the sun reflects its shades on the blue of the lake water. 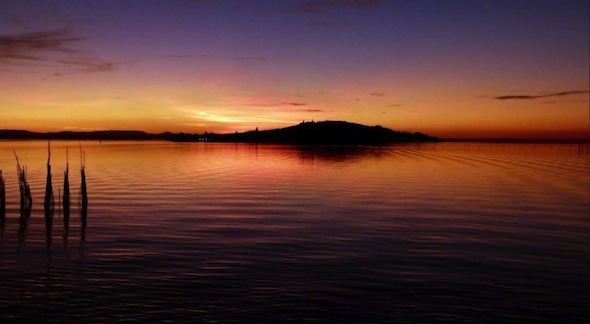 A sunset from the Polvese Island is a show for your eyes and an intense emotions to live. Find out more of Polvese Island with our advices! √ To know what to see on the Island -> read below! The naturalistic area of the island will let you to have a complete experience in contact with the nature. On the island there is an educational Scientific Park dedicated to the research and the ecological tourism. The center proposes many guided tours with thematic visits and activities for children and schools. With its 70 hectars, the island hosts large rushes, the shady holm-oaks area of Saint Leonardo and an ancient olive groves. Take your time to walk along these trees, into the serenity of the island, with the lake waters that peek out from behind leafy branches with their colours and shades. The Garden of Water Plants is really interesting. It takes its name from the famous Italian architect of landscapes Pietro Porcinai, who cureted the project. 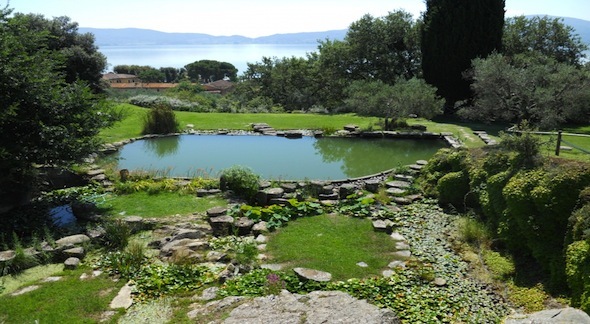 Commissioned by Count Citterio, owner of the island, the garden was designed at the end of '50 and recouped in 1995 thanks to important restoration works. The pool was created in a cave of sandstone, entirely excavated into the rocks until a maximum deep of 5,30 meters. The central basin is surrounded by many "ninfei", smaller lateral basins with different heights. 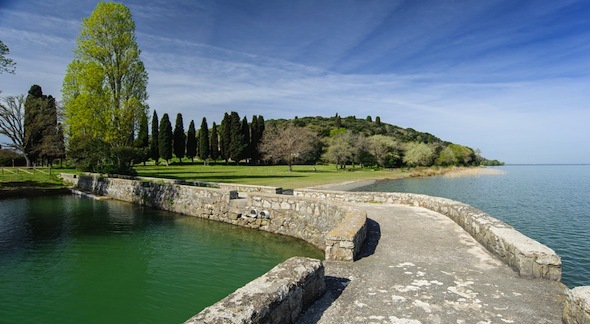 The water of both the central basin and the small basins comes from the Trasimeno Lake water thanks to a system of spaces and shares specifically created by Porcinai to create the illusion of continuity with the lake for those who are immersed into the pool. Around the ninfei there are many water plants and it is possible to see iris, water lilies, lotus, liliums etc. The garden is perfectly integrated with the basins. Nestled in the rocks, it has typical Mediterranean vegetation as myrtle, corbezzolo, thyme, lavander. There are also a large field with olive groves and big rock slabs called "stenditoi", used to have a sunbath along the pool. Built in XIV century, the castle was a fortress able to protect the inhabitants of the island in case of attack or danger (in 1300 there were about 500 people on the island). 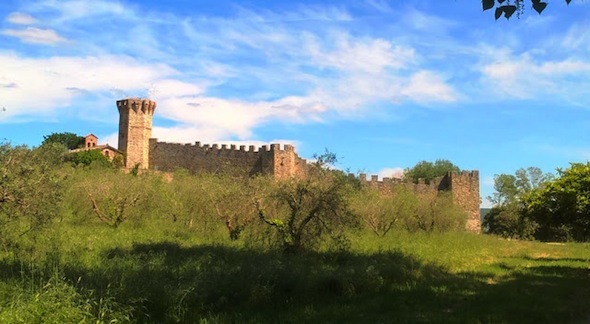 Created to defend the people and the monks of San Secondo - find out more below - the castle hosted the governor of the lake. The castle and also all the island has been moved under the administration of Perugia since 1973. You can see the external walls of the fortress, with the particular form of an irregular pentagon, crowned by 5 towers plus another independent tower located on the ancient entrance. Towers are related by the walls through a walkway, although the caste is usually closed to the public. Once on the island, you will breath the medieval atmosphere and admire the towers, the walls and the interior court setted up as a open air theater. This Church is a real treasure of the island. The small Church of San Giuliano, formed by one only nave, has many affrescos and a part of the Roman opus reticulatum. These remains are cubes of 8 cm by side and are keeped on the wall of the forward square. The affrescos are located on the walls of the apse. Dated of the Umbrian School of 1400, they illustrate many Saints (Saint Guiliano, Saint Sebastiano, Saint Bernardino, Saint Rocco) and other not identificated people. 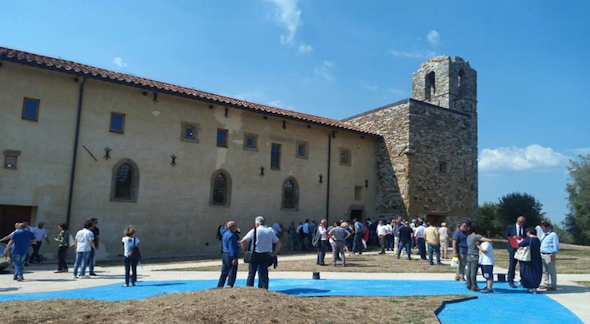 First news about this ancient monastery dated 1000, although it became officially a Monastery between XIV and XV century. It had a period of development but then a decline started, also because of the unhealthy conditions of the island caused by a decrease of the level of waters. The area changed into a swampland and the monks moved to Perugia. Later, the Monastery permanently closed. After the depopulation of the island, also because it became a private property, the Monastery was left to its own devices. The administration of Perugia returned in 1974 and it has taken care of the island since that date. 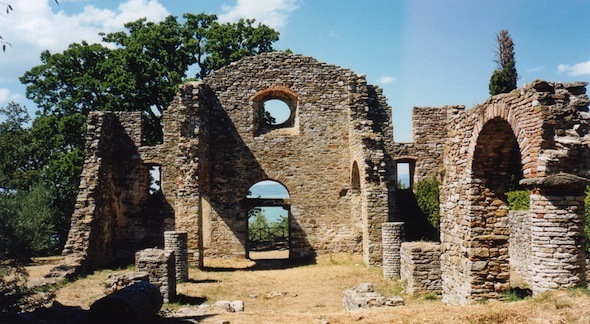 The ruins were restored and today there are the Church, a bell tower and the monastery. Of the original Roman church, built in sandstone and travertine, there are the facade, the external walls, a part of the apse and the crypt. The entrance of the crypt is in a central passage of the apse. It descends to a semicircular ambience dominated by a column of limestone. 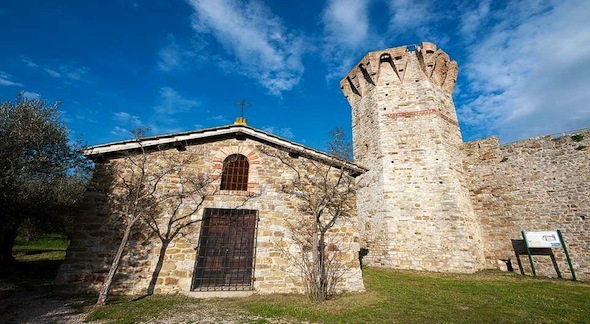 Built on an ancient etruscan wall, the tower has a square base. It is located outside the church, on the north-east corner. The Monastery had had many transformations over time and it only partially preserves the original aspect. The building has two floors and you have to use the external entrance for going upstair. The ground floor was the a refectory and it had a big recess with a statue of the Holy Madonna. In the past, the first floor had many rooms using for the sacristy and the dormitory of the monks. Today it has only one large hall. All the building complex, restored using the original materials and based on a green architecture, has recently been inaugurated and will host a research center on environmental quality. 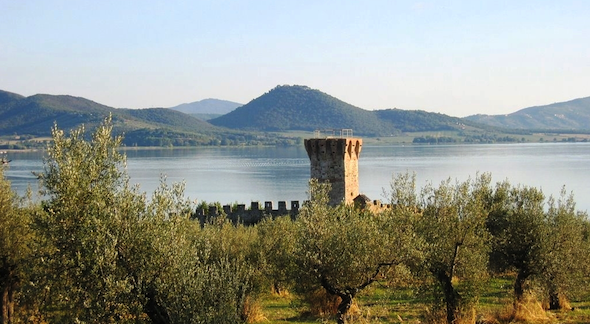 … discovering the Trasimeno Lake and its area! IS WAITING FOR YOU! HAVE A GOOD TIME THERE!